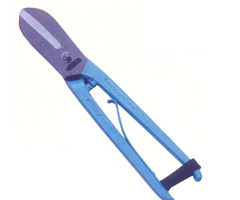 We are one of the leading names in the field of offering Stillson type Tinman's Snips. Made available by us in precision construction standards, these deliver exceptional performance in given applications. The range offered include HO-128 in lengths of 200mm (8"), HO-1210 in lengths of 250mm (10"), HO-1212 in lengths of 300mm (12") and HO-41214 in lengths of 350mm (14").